Smart Allergy Friendly Education: Chocolate Melting Pot - Making Dairy-Free, Homemade Chocolates Just Got Easier! Chocolate Melting Pot - Making Dairy-Free, Homemade Chocolates Just Got Easier! Thanks to my mom, in 2011, my children participated for the first time EVER, in the ritual of having an advent tree /calendar filled with chocolates! Now I do it EVERY YEAR! Below is a picture of the plain chocolates and 'SunButter' Cups I make. Having dairy, nut, peanut, egg AND a few extra allergies during the holidays can be a bit of a bummer, especially for young kids. Chocolate candies seem to be the treat of choice at Halloween. Thanksgiving and Christmas bring gold chocolate coins, advent chocolates and so many other delights that can make your loved ones feel excluded. Making your own chocolates for the holidays? Some make them as an outlet for their 'creative' side. Others make them due to necessity because of milk allergic family members. For me, it's both! Thanks MOM! Making my own milk-free, egg-free and nut-free chocolates just got a lot easier and faster! I have purchased several different holiday molds. With a little Enjoy Life chocolate and some coconut shortening to make pouring easier, I am ready to go in minutes. I also add a little SunButter to some to make our own SunButter Cups. Sorry, microwaveable squeeze bottles! It's time to move on over!! This particular product comes with a spatula, 5 molds, draining rack, dipping spoons and forks, lollipop sticks and recipes. Unfortunately, I can only find them on amazon. I can NO longer find this brand on line, but there are many others available. Just google 'chocolate melting pots' and your wishes will be answered! 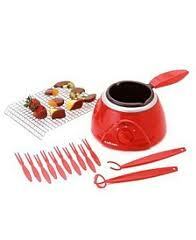 This Wilton Chocolate Pro Electric Melting Pot is just one example of the many you can find on line. So, go buy one! Just like me, you'll wonder why you hadn't thought of it before!! Oh what a cool kitchen tool! Love the idea!